In 1770, American protests led to Parliament's repeal of the Townshend duties — except for the duty on tea retained by the British as a matter of principle. The colonists demonstrated their displeasure with the remaining tax by drinking smuggled tea. The effectiveness of American resistance was shown in the precipitous decline in tea sales in the colonies — a drop of 70 percent over three years. In 1773 Parliament passed the Tea Act, which gave the English East India Company a chance to avert bankruptcy by granting a monopoly on the importation of tea into the colonies. The new regulations allowed the company to sell tea to the colonists at a low price, lower than the price of smuggled tea, even including the required duty. The British reasoned that the Americans would willingly pay the tax if they were able to pay a low price for the tea. On November 28 the Dartmouth arrived in Boston harbor with a cargo of Darjeeling tea. Samuel Adams and other radicals were determined that the cargo would not be landed in the city. His mobs roamed the streets in the evenings, threatening violence if challenged by the authorities. Governor Thomas Hutchinson was equally belligerent and vowed not to capitulate in the face of public opposition as had happened in other colonies. Two other ships, the Beaver and the Eleanor, arrived with more consignments from the East India Company. 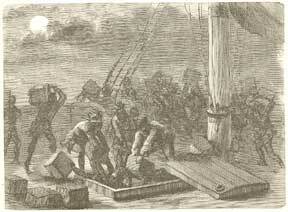 Hutchinson remained firm and stated that the cargoes would be brought ashore and taxed in compliance with the law. The Tea Act required that the requisite tax be collected within 20 days of a ship’s arrival, making December 16 the deadline. Sam Adams kept public fervor high by holding public meetings in the Old South Meeting House; crowds as large as 5,000 clogged the surrounding streets. At one of these gatherings, a resolution was adopted that asked the consignees to return the tea. Those tea agents, some of them relatives of the governor, refused to do so. On December 16, the owner of the Dartmouth agreed to sail his ship back to England. This opportunity to ease tensions was abruptly ended, however, when British officials denied permission for the ship to clear the port and began preparations to seize the vessel for nonpayment of the tax. That evening the ship owner reported his inability to depart from Boston to the throng at Old South. With that news Adams gave a signal to the group and loud Indian war whoops broke out. A group of some 50 men, unconvincingly disguised as Mohawk Indians, moved the short distance to Griffin’s Wharf where the three ships were moored. The vessels were boarded, the cargo carefully taken from the holds and placed on the decks. There, 342 chests were split open and thrown into the harbor. A cheering crowd on the dock shouted its approval for the brewing of this “saltwater tea." The “Tea Party" was quickly restaged in other port cities in America and tended to polarize the sides in the widening dispute. Patriots and Loyalists became more ardent about their views. The prevailing view was that the destruction of private property was unwelcome, but understandable under the circumstances. A popular song of the day was called "Revolutionary Tea." Its first stanza was, "There was an old lady lived over the sea, And she was an Island Queen; Her daughter lived off in a new country, With an ocean of water between. The old lady's pockets were full of gold, But never contented was she, So she called on her daughter to pay her a tax, Of three pence a pound on her tea, Of three pence a pound on her tea." Parliament and King chafed at the destruction of private property and the deliberate flouting of royal authority. They would soon turn to sterner actions. See timeline of the American Revolution and Boston map . The Shoemaker and the Tea Party: Memory and the American Revolution by Alfred F. Young.